Gum problems can be caused by the build-up of plaque bacteria and if left untreated, can affect your oral health. Such bacteria build up on and around your teeth can also lead to bad breath. Corsodyl Fresh Mint Daily Mouthwash contains 0.06% chlorhexidine to help reduce bad breath bacteria. Corsodyl Fresh Mint Daily Mouthwash provides 24-hour gum protection* against plaque build-up. It is clinically proven to reduce plaque and also helps to remove more plaque than brushing alone and helps prevent further build up*. Used every day it helps protect teeth from plaque that can cause gum disease. 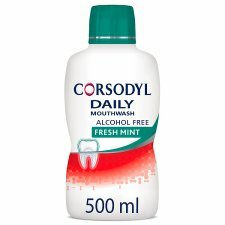 Corsodyl Fresh Mint Daily Mouthwash contains 0.06% chlorhexidine which helps to reduce bacteria which causes bad breath. It also contains fluoride to strengthen teeth and help prevent cavities. *when used twice daily in combination with tooth brushing. Stop using the mouthwash and seek immediate medical help if you get a rash, swelling of the mouth or face or have difficulty breathing. These effects may be symptoms of an allergic reaction which is very rare. As with any other oral care product if irritation occurs, discontinue use. Keep out of reach of children. Not for use by children under 12 years of age, unless on advice of a dental professional or doctor. Temporary discolouration of the teeth and tongue may occur, which can be removed by twice daily brushing or by your dentist or hygienist. You can avoid staining by not drinking tea, coffee or red wine, especially up to one hour after use, and by twice daily brushing with toothpaste.